From Windsor Central Station a shuttle train will take you to Slough Station, platform 1. You will need to cross to platform 5, or sometimes platform 3, via the footbridge, for London trains. Journey time Windsor - Slough. 5 - 6 minutes. No other stops. 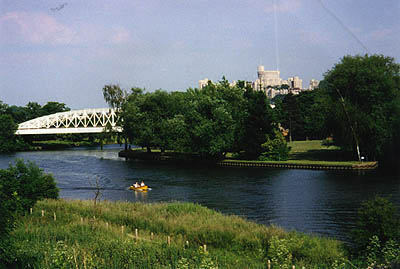 Train uses raised brick viaduct over the Thames with great views of Windsor Castle. From Slough to Paddington, London takes around 22 minutes, with perhaps 1 or two stops depending on the service selected. Once at Paddington, admire the huge vaulted roof of the Great Western Railway Terminus, and follow the signs to the Underground, the buses, the taxis, etc. From Windsor and Eton Riverside Station the train will take you straight to Waterloo, albeit rather more slowly than the Paddington service. However, Waterloo is more central than Paddington and this service may be more convenient for the City of London, and certainly is better for the South Bank complex, Royal Festival Hall and London Eye. Journey time Windsor - Waterloo. 50 - 55 minutes. Several stops. Train passes mainly to the north of the river through Staines as far as Richmond, thereafter south via Clapham Junction, among others, to Waterloo, on the South Bank of the Thames in London.